Is weight loss like the closet? I've had a couple of conversations recently in which I've been thinking about weight loss being a bit like the closet. Marilyn Wann makes a useful point about fat people being in a pre-Stonewall state, and I agree with her. Adding to her argument, I'd say that before Stonewall, more queer people chose to stay closeted because circumstances made it nearly impossible to be out. These days, I think that the closet is a pertinent analogy for weight loss. 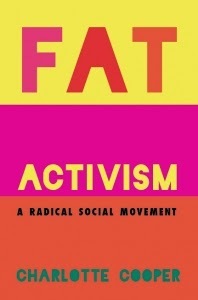 It is my feeling that weight loss is not revolutionary and that it supports fatphobic systems, though I'd be interested in hearing opinions and thoughts to the contrary. I think positive social change around fat is more likely to happen if people choose not to buy into weight loss as a viable choice. But I recognise that not buying into weight loss is a hard path to follow given that, as citizens of 21st century Western society, we live in an extremely fatphobic culture, one which affects super-sized people in particular. It's as though fat people must choose between two things, weight loss/living fat in a fatphobic society, that the choices are crappy, and are not really choices because they really just highlight what limited options there are for you if you are fat. Thinking about why people remained closeted pre-Stonewall, and in various contexts today, it's easy to see why people make that choice, and also why people might choose weight loss, despite the associated risks. I think people have agency, and their own sense of internal logic, and make decisions based on this. I've heard of the closet and weight loss being contextualised as personal choices, yet I'm sceptical that these choices can ever be purely personal because I think bodies are public and political entities too, whether or not we want them to be. I'm bothered by the individualism inherent in weight loss and I try and make choices that don't only benefit myself but also try to support wider social change. I don't want to demonise or shame people if they try to lose weight, even though I don't choose this route for myself. I think that using the closet as an analogy for weight loss, and thinking about fat people being in a pre-Stonewall state, as a population with agency but little choice, is a helpful way of thinking about fat activists who choose weight loss. It recognises the social context for weight loss, acknowledges the pressures on individuals, suggests that social change could still happen despite these constraints, and is a more compassionate approach than finger-wagging and rule-setting. Lizzie Whitlock (1853-1899) was apparently the original fat circus lady. 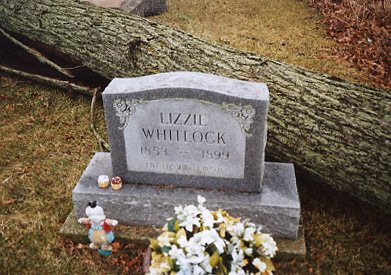 I can't find any pictures of her online, but her grave is now an offbeat tourist attraction in rural Michigan, Batavia Cemetery to be exact. Findagrave says: "She joined the circus at age 14, travelled with many outfits including Barnum and Bailey's. When she died she weighed 650. The windows were removed from the home to remove her body. She was married 3 times and had four children." I'll bet her truth was a lot more complicated than that. Anyway, a group of us fatties paid a visit in January 2007, and left her some cupcakes. 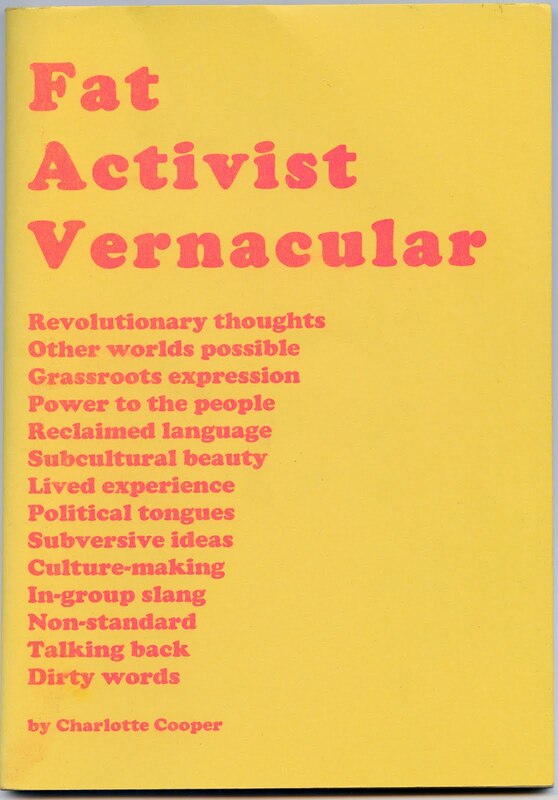 Rob Adderley is the designer. I did a little digging and, despite the fact that Boomerang are not returning my calls, I found out that the company had a competition inviting advertisers to design an awareness campaign to tackle obesity. 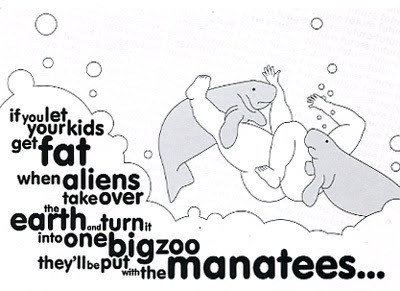 There were 12 winning designs, I'd love to see the others, of which the manatee is one. The back says: "…but seriously, think of the future." "Tackling obesity" is an expression that usually raises a smirk, but I have to say that this card really puzzles me. 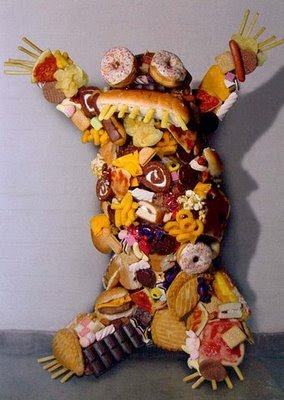 I'm assuming that the brief was all about obesity prevention, but this lovely, playful image reads like an ad for obesity. The little fatty in the picture looks perfectly happy to frolic amidst the manatees. Hell, I'd be happy if manatees kidnapped me too, I can't think of anything nicer than bobbing around in warm shallows eating stray bits of vegetation with these lovely gentle creatures. This isn't the first time that allegedly anti-obesity advertising has backfired. The Obesity Monster is supposed to scare us skinny but, as my friend E says: "look at his lovely little hands and his growly wittle face!"